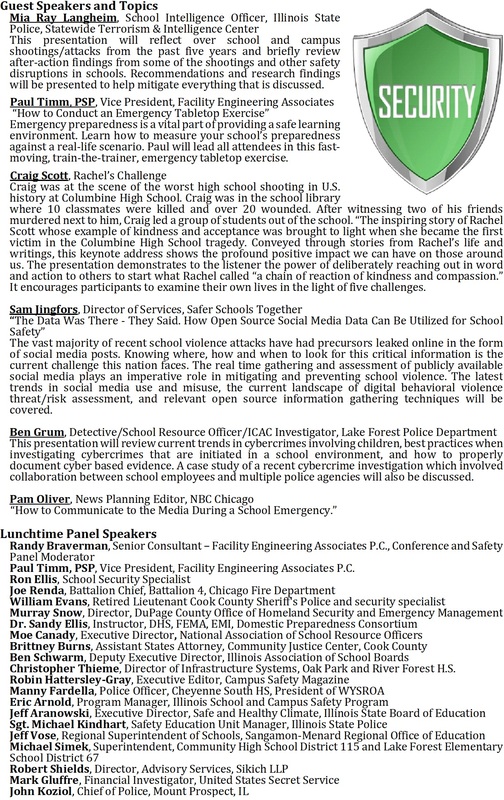 The Illinois State Board of Education, Illinois Emergency Management Agency, Facility Engineering Associates P.C., Lake Forest Elementary School District 67, Township High School District 211, Illinois School Resource Officers Association, Archdiocese of Chicago Office of Catholic Schools and Proviso Area for Exceptional Children invite you to heighten your safety awareness by attending a gathering of experts in the field of school safety and crisis prevention. At no cost to you, you can learn how to enhance the safety and security of your school facility on a day-to-day basis and long term. This vital information will be practical and easy to apply, and there will be ample time for you to ask specific questions. Theodore Roosevelt once said, “you never have trouble if you are prepared for it.” This statement takes on significant meaning as schools try to ensure the safety of their students in today’s vulnerable world. We hope you will join us to hear from the subject matter experts. Access to Exceptional Safety and Security Vendors! Thank you for all your interest but we are now at capacity! Registration is now closed!!!!!!! For more information contact Randy Braverman via email (randy.braverman@feapc.com) or call at 224-578-0484.